The Rock and Roll Hall of Fame has been around long enough to honor a long list of the artists whose music fed into the genre’s roots. Now that we’ve entered an era in which the rock stars of the ’90s have become eligible for induction, it can be all too easy to assume that the most important names of the past have already been honored. 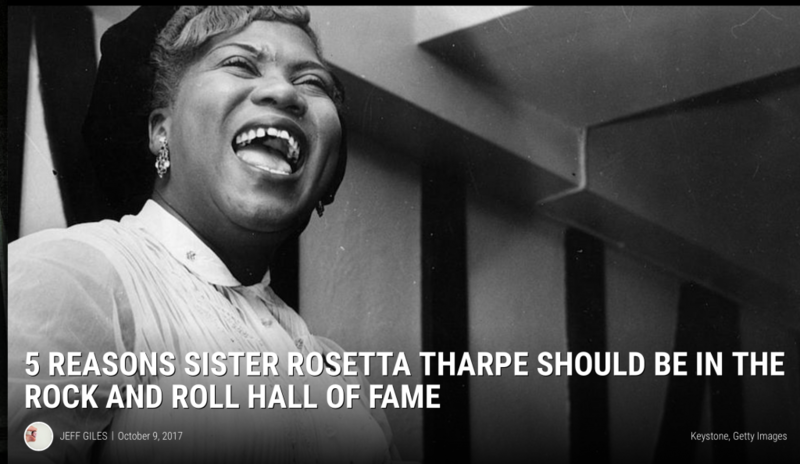 That’s a faulty assumption, however — and Sister Rosetta Tharpe, the pioneering singer, songwriter, and guitarist listed among this year’s potential honorees, is a perfect example of a rock ‘n’ roll forbear who definitely deserves to be enshrined in the Hall. She’s far from a household name, particularly among younger generations of rock fans, and you aren’t likely to find any of her recordings on the radio dial — on rock stations or otherwise. But even if she’s never really received her commercial or cultural due, there’s no escaping Sister Tharpe’s fundamental influence on generations of artists who came after her, and any institution dedicated to honoring rock history is incomplete without a space reserved for honoring her legacy.